Yay, today is the day that the Nordstrom Anniversary Sale is open for everyone! What will you be buying? If I had to choose my favorite item purchased from the sale (so far), it has to be this Leith cardigan. The funny thing, this is actually one of the items that didn't come home with me after shopping the sale at my local Nordstrom. If you read my fitting room diary post, then you know that I had major regrets about not purchasing this cardigan, so I ended up ordering it online that night. Now, my only regret is not getting it in the blush color, which is currently sold out. Trust me when I say that I have been stocking the Nordstrom site like a hawk, and if the blush comes back in stock, I'll be snagging it! It is also available in burgundy and grey, and although I don't need another grey sweater, I keep debating if I'll should get the burgundy too..... What do you think? 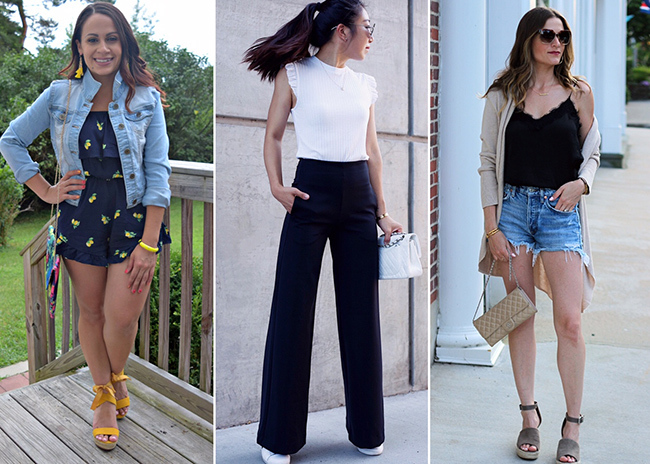 Even though I couldn't wait to rip off the tags from all my #NSALE finds, I'm nowhere near ready for summer to end, so my fall clothing can still hide in my closet for a while longer. However, when it comes to cardigans, it's a different story. I'm one of those people who are always cold, so cardigans are a staple in my summer wardrobe. They are perfect for throwing on when the air conditioning is too cold (which is usually always), plus summer nights up at the lake can get pretty chilly, so I'm always wrapping myself up in a cozy cardigan when we are hanging outside. I love how this sweater instantly gives my denim shorts and camisole a cozy feel. My camisole is also part of the Nordstrom sale, and these shorts are by far the best pair of denim shorts that I have ever owed. Not only are they a higher rise (perfect for us mommies) but they look great with everything from bathing suits to blouses. What are everyone's weekend plans, besides shopping? 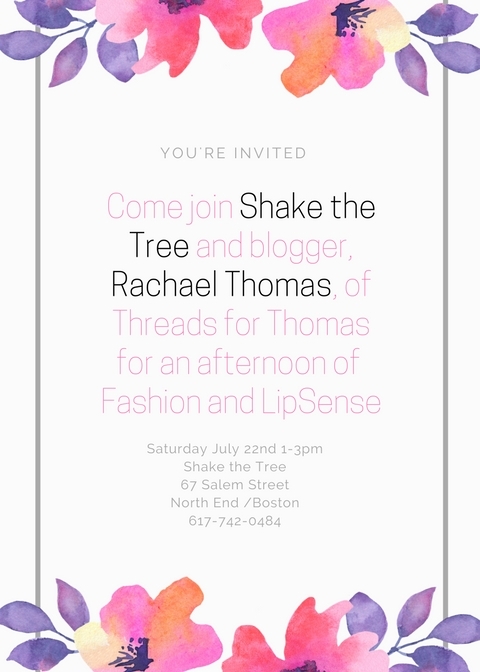 I'm so excited because I'm hosting an event at one of my favorite Boston boutiques, Shake the Tree. You may recognize the name because I have featured clothing from the boutique on blog before (here and here). I will be at the store from 1-3pm this Saturday, talking about all things fashion and beauty. As some of you know, I also sell the best lipstick ever, LipSense, and will have it with me! So if you are local and have been wanting to try it, make sure to stop by. I'd love to see everyone! The feature blogger is Kileen of Cute and Little. I'm obsessing over her swimsuit, and how stylish she is for the beach! Make sure stop by her blog and say hello! That sweater is going to be a great staple! This is such a chic summer look! Great outfit! I also find myself feeling chilled often and always have something to throw over my shoulders. Hope you find the blush one over the next few days. Love the cardi! So funny that you didn't buy it and ended up going back to order it. Sounds like something I would do too. Great cardigan! Perfect all-season staple! Love a great pair of denim cutoffs!! Great cardigan! Perfect how you styled it now, and a perfect transition piece! All I can think is legs haha! But you look amazing! I snatched up that cardi in blush and am debating this color too. Pretty sweater and that whole look created is soo fun! Wonderful Summer look! I love the cardigan - I hope you manage to track it down in blush! That cardigan does look really cozy, and I always hate it when I have non-buyers remorse, it's just as bad as buyers remorse! The neutral color of that cardi will work with a lot of different outfits! That cami under it is adorable! What a sleek cardigan! The knit is perfect for a dressy or casual look! That sweater looks gorgeous indeed. Beautiful with the shorts and cami top! Love this! I bought this sweater too! This look is so chic, Love your jeans.